Well, you won't need every single bit of imagination, I guess, for Striker, Searcher, Sub-Zero and TUrbine. Anyways, for the armours, you can just trace it off something, that's my idea. Yeah, and I helped to design Scuba, Chaser and Dropship. Still I think I'll be able to do Wing fairly well. As for the armor, my drawing style is kind of Chibi-ish so the main issue is getting everything to fit in ... and the helmets, the helmets are tricky as hell. For Chaser, I always imagined it with a normal red truck cabin, only with a vehicle entering from the bed, which is behind the cabin. Behind that are two long ajoined bed parts, with a black catipilar track-style print on the top, with the base red and white, with dark grey rims. For Scuba, I thought of it like an egg-shaped vehicle with a clear part up by the top-front, reacing to the bacl where there's a green body with turbines, and an emergency exit area. Also has the UFDA emblem on the side of the turbines, with one on the front of the transparent cover part. Just wondering, do you know what the Chasers are based off of? Also, I like you're idea for the catterpillar track styling on the top of the Chasers, and Scuba is very similar to how I imagined it ... but think blue instead of Green. I had an idea for a character and I think it's quite good so ... yeah I've made an R5. Image: Tall with short black hair, she has a small scar on her left cheek. Pretty much all of her possesions have some "Childish doodles" all over them. Bio: Sakura has severed all connections with her family recently because of the abuse she suffered as a child which has left her socially crippled and bad at interacting with people. She joined Rescue Force after finding out that she finds talking easier if she's in the middle of a crisis (comforting people etc.) while helping a couple of people escape from a house fire. Personality: Sakura acts cold and dislikes social interaction, preffering to focus on the job at hand than anything else. However she often starts drawing cute little squiggles on anything she can find whenever she's idle as some sort of weird way of trying to regain the childhood that she never had. Armor color: The chestplate and lines running through her suit are a sort of lime green and the undersuit is primarily lilac. Yellow visor and number. Interesting, I like it. Approved. Image (or description):He has spiked black hair, extremely pale skin with green eyes, a small mouth and a long nose. Bio:During a rescue, James suffered an injury, causing brain damage. Despite this setback, whenever he is on a rescue, fight, or something you need to put your mind to, he is like a robot. He is extremely skilled in rescuing, medical, fighting, the brain damage mainly affected his more educatial skills, such as writing, reading, maths, etc. He is fluent in several languages. Before he joined the UFDA as the Supreme Commander of Rescue Force, he travelled overseas, returning to America, and visting places such as Hawaii, Fiji, New Zealand, Australia, Korea, Thailand, etc. He easily picks things up and is fluent in the tounge of almost every country he visited. His last rescue was when he equiped into RU, but in a gas explosion, his armour was ripped apart and he suffered severe injuries. His life was no easy matter then, but now he spends his time inside his home, his new Rescue Suit on standby for a rescue. He is by far the most skilled member the UFDA had, with R0 being second even to him. Personality:Silly, somewhat stupid and childish, but serious and skilled at other times. His voice only sometimes has a slight hint of emotion. Armor color:His armour is gold, with black lettering. The lettering is a large R with a small word after it, saying 'SOUL'. This is also his codename. It comes from his last name, which is similar to 'soul(damashi). 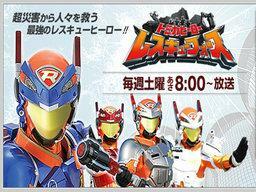 He has a green visor, white undersuit and orange lines like R1MAX. His visor is different from the others, as it has a small car-siren type parts with a light in the middle of them. He also has extra armour on the side like the Fire1 helmet, with a dozer mouthguard. He has bulkier chest and shoulder armour, with a prototype of 'Rescue Summoner' on his arm. Rescue Summoner is a bulky gauntlet-type armour piece, with touch screen, holographics projecter, master radio frequency generator, and many more parts. It is only a prototype, so it is unsure how much of it can be properly used. Specialty (optional):Everything, but mental skills. As I said, he'll be like an R0/U character. Although, he might appear every now and then without his armour, annoying everyone. Okay, still hope this works fine. Kinda light wieght to my ussual porfiles, but I've been told I gotta loosen up anyway, whihc is a definite reason I'm here. Give her whatever specialty and vehicle you need. Bio: Adopted at a young age by a convenient store owner and an infertile salary man in Osaka, Michiyo had pressure on her from the start. Her nose was in the books most of the time, no nonsense, even avoiding “Otaku flummery”. Though most fo her school years she was a regular shrinking violet (Dandere). Eventually she snapped and got mixed in with some yankis, and got in deep, eventually getting assaulted for not being able to pay a debt. Saved by a female police officer, Michiyo eventually decided to get back on the right track, though barely got into a good college. She became a police officer, and her Her Kansai-ben (Kansai regional accent- I’ll render it as either a Brooklyn or Southern accent, depending on what you prefer) quickly became famous among her precinct as a trick to make catch criminals off guard, though it eventually just became habit. Eventually, she got where she their wasn’t much higher on the ladder to go, despite occasionally veering off the direct path of her superiours and grew bored. Highly recommended, she expects life as a member of the Rescue Force to be a thrill ride. Personality: Fuka is not unlike a parakeet: hyper active, colorful, lacking an indoor voice, and sometimes a pain precisely because of those things. Although book smart she definitely has her quirks and buttons that would make you think otherwise when pressed. A particualry notable case of this her habit of making long speeches as things like love adn justice. She also has a habit of segueing from the desired topic, insistent terminology, and an ironically poor self body image. She is still quite competent and even stern when push comes, and seems to be smarter than she lets on, trying being plain underhanded if need be to get the job done, though still more than fettered. And can even seem down right cynical, at times, especially after a few beers. Armor color: Blue, of course. R6 I assume? Or something else? Either way, approved. Maybe she could be a tranfer from Europe/America. 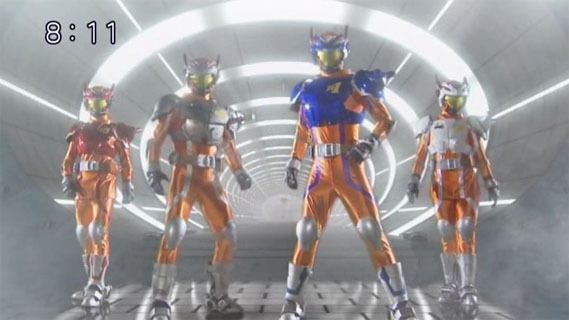 Or we could have a second Pheonix built, with a back-up squad, maybe led by Kyousuke or something? Or we could make it James decided to make a group of extras. Or something random. James should be an NPC if the latter happens. And, this'll sound bad(In my opinion), but could I be made a mod? Lastly, my avi thing's blocked for some reason, I can't find where I change it. Image: Ta-Dah!, yeah he's basically Takeru Sato but with glasses, and a business suit. Bio: Kenji Kato was born to Scottish and Japanese parents, was integrated into the new Rescue Force team by ANGER as a way of better managing the collateral damage caused by giant mecha. Former childhood friend of Sakura, knows more about her past than the others. Has dirt on everybody but is trying to bury it so that the new Rescue Force team doesn't end in a scandal. Personality: Panicky, Stressed and a little bit Bitchy at work. When he's relaxing he's usually Calm, Happy and Cheerful. Sounds like a good plan, interesting. Approved. Maybe he could be the guy Nakida nutted in one of her flashbacks? Bio: Born in Sujou Village, she has an arranged marriage to Ren. The two were somewhat close as children, due to what they knew was expected of them in the future. She remained in the village while Ren put off the marriage and went to work for Rescue Force and the UFDA. Personality: Yuki is a caring, quiet woman. She wants to be happy, but is somewhat uncomfortable with what is expected of her, as is Ren. She cares about him, but isn't sure if she wants to spend the rest of her life with him. She is completely willing to do so, to follow her parent's wishes. It'll be good, I"m sure. Is this toku or drama? Who say's Toku can't be drama? Look at GARO as probably the best example. Try Veoh. I'll go and see if I can find the Megavideo links, though, since I'll need them eventually, possibly. Tried on Veoh three billion times. It's not on there. Well, not subbed.